P.J. Katz, like everyone else Rush knew has been fooled into thinking Rush is normal, so he’s isn’t reluctant to call with a new writing assignment – the biography of an aging film star. The biography of Iris Cameron will require Rush to physically visit her and his agent and thus to venture outside the bounds of his home and routine. So the computer program gives Rush a pager with a digital display readout and calls a cab. Disoriented and out of sorts Rush somehow manages not to screw up either the meeting with his agent or Iris Cameron, but when he returns home, Rush’s computer has recorded a death threat from an anonymous caller – if Rush doesn’t stop writing the biography of Iris Cameron, he’s a “dead man.” This threat eventually leads to something the first Rush Lightbody, the young man who wrote the computer program, could never have expected – Rush becoming the prime suspect in serial killer murder investigation! Its now up to a dementia suffering screenwriter and a few lines of code in a PC to both keep Rush alive and discover the real killer. The plot as detailed above may remind you of a combination of Christopher Nolan’s independent film Memento (2000), and Billy Wilder’s Sunset Blvd. (1950). But while Mind Slash Matter is certainly inspired by the latter, it precedes the former by a good five years. And as a big fan of both those films I am pleased to announce the resemblance in plots is also duplicated in the quality. 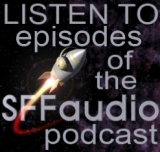 Mind Slash Matter is one of the most riveting audiobooks I’ve ever heard! Upon finishing it I immediately attempted to track down more audiobooks by Edward Wellen, but unfortunately he wrote only two novels, and only one other story has been recorded as an audiobook – a short story I highly recommend you track down called “Mouthpiece”. But back to Mind Slash Matter, this is suspenseful, unpredictable, thought provoking and even funny novel with a mentally disabled detective solving a murder mystery. And frankly this story amazes me. Wellen has done the impossible. He’s written something completely and undeniably original. Wellen’s portrayal of what it’s like to live with Alzheimer’s disease is insightful and frightening, and his ideas as presented are almost a meditation on the boundaries of the human mind, a recurrent theme in Wellen’s fiction. The sum is a very powerful tale – and an unforgettable audio experience. René Auberjonois, the reader, will have a familiar voice to many listeners since he played Odo on Star Trek: Deep Space Nine. His performance here is excellent, using different voices for each character and particularly able to inject emotion into Rush’s thoughts – fear, anger, frustration, and confusion. For a straight reading – no music, no voice effects – this is perfect. Cover art is a little hard to decipher but is adequate. 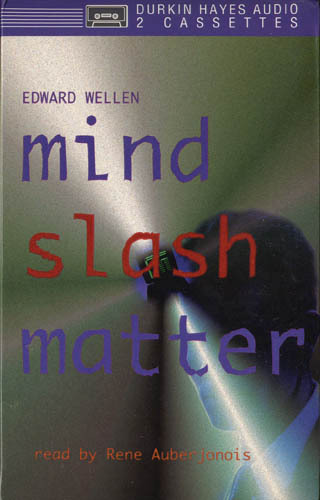 To top it all off, Mind Slash Matter was, until recently, only available only as an audiobook. Such an amazing story and straight to audio!